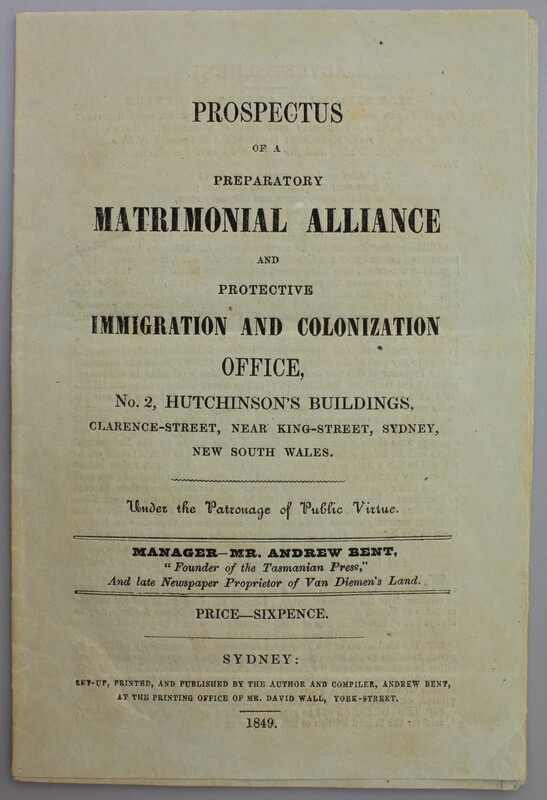 Prospectus of a Preparatory Matrimonial Alliance and Protective Immigration and Colonization Office, No. 2, Hutchinson’s Buildings, Clarence-Street, near King-Street, Sydney, New South Wales. Under Patronage of Public Virtue. Manager – Mr. Andrew Bent, “Founder of the Tasmanian Press,” and late Newspaper Proprietor of Van Diemen’s Land. Sydney: Set-up, printed, and published by the author and compiler, Andrew Bent, at the Printing Office of Mr. David Wall, York-street. 1849. 16 pp, 19 x 12.5 cm. This matrimonial agency was Bent’s last attempt to set up in business in Sydney. The prospectus, with its doggerel verse, rambling lucubration on a wide variety of topics, and its harking back to past glories, reveals him to be seriously, although harmlessly, deranged. It also reveals an undiminished belief in the power of the press, concern for family values and for the future of his adopted country. 10,000 copies of the prospectus had, he said, been printed. Arrangements for forwarding copies through the post were detailed, the kind offices of the provincial journalists were solicited in giving insertion to his advertisement (payment could be made by providing copies of the pamphlet if so desired), and ten guineas was offered for the best-written essay on matrimony, if used for the second edition. The prospectus was noticed with amusement in a few newspapers, the Moreton Bay Courier commenting on 2 Feb. 1850 that ‘there is a vein of singularity, and even absurdity running through the whole pamphlet, which, accompanied as it is by a most rambling and unconnected style of composition, cannot fail to excite involuntary mirth, where, perhaps, a very different effect was intended.’ The Hobarton Guardian noted on 26 June 1850 that Bent had sent in several copies some time previously. This curious and well-printed little pamphlet, which is both funny and very sad, would probably have disappeared without trace, if Bent had not sent a copy to the Colonial Secretary, suggesting that the Immigration Agent should distribute it to the increasing numbers of young migrant women arriving in New South Wales. The rather bemused government officials declined to take up this novel idea but did not return the prospectus, and it remains on file, in pristine condition, with Bent’s letter.